Main Product Lines : Buying and Selling the electrical products of categories Switchgears, Cables, Lighting, Motors, Automation, Engineering. We have a registered vendor network across India from whom we source and sell it to the customers buying from our portal. ‘Star’ Product /State-of-the Art Design/Front-running Product : Our star service is Get Instant Quote, Check Pan India Availability and 3 Days Reverse Auction. Buyer can save time and money by buying through our portal. They can be assured of Genuine products as we have Bureau Veritas as our Quality Check Partner and also they don’t have to worry about on-time delivery as we have Mahindra Logistics as our logistic partner. Buyer can get instant quote from our existing list of vendors or if he has time then he can opt for reverse auction and get even better competitive price. Quality credentials of products (ISO/ CE/UL /CSA/RoHS etc.) : Buyer can get product quality check done by Bureau Veritas who is our Quality Check Partner. We are also ISO 9001 certified. Names of locations of branch offices : Currently no branch offices. Everything is handled from HO. 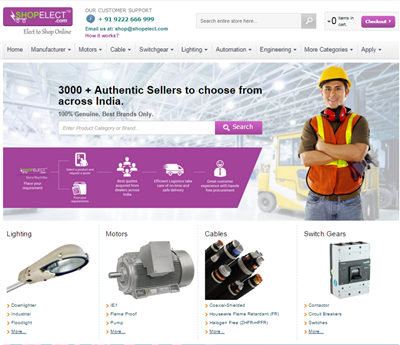 ShopElect is India's largest online store of genuine industrial suppliers. 100% genuine products of best brands are sold with 45 days money-back guarantee. ShopElect has a global network of panel builders, contractors, consultants, dealers & manufacturers. With over 1.5 million products, ShopElect offers single window solution for sourcing. 1. What were thoughts and philosophies for starting your business? To convert the traditional industrial distribution business into a professionally managed, technology driven ecommerce organization using our 45 years of industry experience. We want to create India’s most impactful and customer centric digital ecosystem which transform electrical procurement and supply business that delivers ease, efficiency, speed for all stakeholders thereby creating highest value for all. 2. To what extent you feel having fulfilled your objectives today? Yes we have fulfilled our objectives in certain ways and still on the path of meeting it in entirety which will happen soon. 3. What according to you are your positive points towards growth and sustenance of your business? We are the aggregator of over 65 brands and 2.5 lakh products. We have a back office team who is expert in their respective field and is always prepared to make the customer journey hassle free. 4. What are your considerations/ideas when you develop and introduce any new product or concept? To create customer centric digital ecosystem which transform electrical procurement and supply business that delivers ease, efficiency, speed for all stakeholders. 5. What are your growth/expansion plans for next 5 years? In next five years we want to increase our customer base and vendor base and reach to 640 cr. We are the niche player in the electrical industry so we are much focused and this will help us to meet our growth plans both nationally and internationally. 7. Do you have any activities in practice for improving performance, loyalty and retention of your employees? You may like to mention those here along with your experience. We have introduced flexi timing and reduced work hours for the employees so that they can maintain work life balance and can become an asset for the company. 8. Would you like to mention about your CSR activities towards society? We conduct RWA activities and school connect programmes to increase the awareness of power saving, green energy etc. 9. Do you take up any specific actions and undertake activities for environment protection? We recognizes the importance of protecting the global ecosystem minimizing our environmental footprint and reducing the use of natural resources by offering and encouraging business solutions in ways that support responsible and sustainable development. We are committed to continuous improvement of the environmental performance to mimimize the adverse impact on environment and we are encouraging our employees and business partners to do the same.